My dear sisters, you marvelous women who have chosen the better part, I stand in great admiration for all that you do. I see your hands in everything. Many of you are mothers, and that is enough to occupy one’s full time. You are companions—the very best friends your husbands have or ever will have. You are housekeepers. That doesn’t sound like much, does it? But what a job it is to keep a house clean and tidy. You are shoppers. Until I got older I never dreamed of what a demanding responsibility it is to keep food in the pantry, to keep clothing neat and presentable, to buy all that is needed to keep a home running. You are nurses. With every illness that comes along, you are the first to be told about it and the first to respond with help. In cases of serious sickness, you are at the bedside day and night, comforting, encouraging, ministering, praying. You are the family chauffeur. You are driving your children about on paper routes, taking them to athletic events, driving them on ward outings, hauling here, there, and everywhere as they pursue their busy lives. She has been their strength all of their lives. Since they were babies they have looked to her, and she has always responded with affection, guidance, teaching, blessing their lives in every way. Now we have granddaughters who are mothers. They visit us, and I marvel at their patience, at their capacity to calm their children, to stop them from crying, and it seems to me to do a thousand other things. They drive cars, they run computers, they attend the activities of their children, they cook and sew, they teach classes, and they speak in church. Well, you dear women, I say thanks to you. Thank you for being the kind of people you are and doing the things you do. May the blessings of heaven rest upon you. May your prayers be answered and your hopes and dreams become realities. You serve so well in the Church. You think it is so demanding. It is. But with every responsibility fulfilled, there comes a great reward. Many of you think you are failures. You feel you cannot do well, that with all of your effort it is not sufficient. We all feel that way. I feel that way as I speak to you tonight. I long for, I pray for the power and the capacity to lift you, to inspire you, to thank you, to praise you, and to bring a measure of gladness into your hearts. We all worry about our performance. We all wish we could do better. But unfortunately we do not realize, we do not often see the results that come of what we do. I remember going to a stake conference in the East many years ago. On the plane coming home, I felt that I had been a total failure. I felt I had not touched anyone for good. I was miserable with a sense of inadequacy. The man said: “You touched my heart. I came to that meeting out of curiosity. I really had no interest. I was on the verge of leaving the Church. But when it was announced that one of the Twelve Apostles would be there, I decided to go. Now, my dear sisters, that is the way with you. You are doing the best you can, and that best results in good to yourself and to others. Do not nag yourself with a sense of failure. Get on your knees and ask for the blessings of the Lord; then stand on your feet and do what you are asked to do. Then leave the matter in the hands of the Lord. You will discover that you have accomplished something beyond price. Now, we have a very diverse group to whom I am speaking. This includes young women who are still in school or who are working. You are single. You are hoping to catch that perfect man. I have yet to see one who is perfect. Aim high, but do not aim so high that you totally miss the target. What really matters is that he will love you, that he will respect you, that he will honor you, that he will be absolutely true to you, that he will give you freedom of expression and let you fly in the development of your own talents. He is not going to be perfect, but if he is kind and thoughtful, if he knows how to work and earn a living, if he is honest and full of faith, the chances are that you will not go wrong, that you will be immensely happy. Some of you, unfortunately, will never marry in this life. That turns out to be the case sometimes. If that happens, do not spend your life grieving over it. The world still needs your talents. It needs your contribution. The Church needs your faith. It needs your strong, helping hand. Life is never a failure until we call it such. There are so many who need your helping hands, your loving smile, your tender thoughtfulness. I see so many capable, attractive, wonderful women whom romance has passed by. I do not understand it, but I know that in the plan of the Almighty, the eternal plan which we call God’s plan of happiness, there will be opportunity and reward for all who seek them. To you young women with small children, yours is a tremendous challenge. So often there is not enough money. You must scrimp and save. You must be wise and careful in your expenditures. You must be strong and bold and brave and march forward with gladness in your eye and love in your heart. How blessed you are, my dear young mothers. You have children who will be yours forever. I hope that you have been sealed in the house of the Lord and that your family will be an everlasting family in the kingdom of our Father. May you be given strength to carry your heavy load, to meet every obligation, to walk side by side with a good and faithful and caring man, and together with him rear and nurture and bring up your children in righteousness and truth. Nothing else you will ever own, no worldly thing you will ever acquire will be worth so much as the love of your children. God bless you, my dear, dear young mothers. Then we have you older women who are neither young nor old. You are in the most wonderful season of your lives. Your children are in their teens. Possibly one or two are married. Some are on missions, and you are sacrificing to keep them in the field. You are hoping and praying for their success and happiness. To you dear women I offer some special counsel. Count your blessings; name them one by one. You don’t need a great big mansion of a house with an all-consuming mortgage that goes on forever. You do need a comfortable and pleasant home where love abides. Someone has said that there is no more beautiful picture than that of a good woman cooking a meal for those she loves. Weigh carefully that which you do. You do not need some of the extravagances that working outside the home might bring. Weigh carefully the importance of your being in the home when your children come from school. Mothers, take good care of your daughters. Be close to them. Listen to them. Talk with them. Lead them from doing foolish things. Guide them into doing the right thing. See that they dress in a comely and modest fashion. Safeguard them from the terrible evils that are all about them. Nurture your sons with love and counsel. Teach them the importance of personal cleanliness, of neatness in their dress. Sloppy ways lead to sloppy lives. Instill in them a sense of discipline. Keep them worthy of service to the Church as missionaries. Give them things to do so that they may learn to work. Teach them to be frugal. Labor and frugality lead to prosperity. Teach them that nothing really good happens after 11 o’clock at night. And do not spoil them. If they go on missions, they may be compelled to live in circumstances that you would not wish for them. Do not worry about them. Give them encouragement. Now I speak to you single mothers whose burdens are so heavy because you have been abandoned or have been widowed. Yours is a terrible load. Bear it well. Seek the blessings of the Lord. Be grateful for any assistance that may come out of the quorums of the priesthood to help you in your home or with other matters. Pray silently in your closet, and let the tears flow if they must come. But put a smile on your face whenever you are before your children or others. Now to you dear grandmothers, you older widows, and older lonely women. How beautiful you are. I look upon my dear wife, soon to be 92 years of age. Her hair is white; her frame is stooped. I take one of her hands in mine and look at it. Once it was so beautiful, the flesh firm and clear. Now it is wrinkled and a little bony and not very strong. But it speaks of love and constancy and faith, of hard work through the years. Her memory is not what it once was. She can remember things that happened half a century ago but may not remember what happened half an hour ago. I am like that, too. But I am so grateful for her. For 66 years we have walked together, hand in hand, with love and encouragement, with appreciation and respect. It cannot be very long before one of us will step through the veil. I hope the other will follow soon. I just would not know how to get along without her, even on the other side, and I would hope that she would not know how to get along without me. My dear friends of the Relief Society, whatever your circumstances, wherever you may live, may the windows of heaven be opened and blessings come down upon you. May you live with love one for another. May you reach down to lift up those whose burdens are heavy. May you bring light and beauty to the world and particularly into your homes and into the lives of your children. You know as I do that God our Eternal Father lives. He loves you. You know as I do that Jesus is the Christ, His immortal Son, our Redeemer. 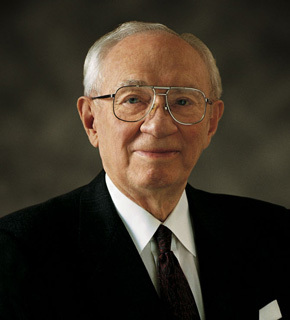 You know that the gospel is true and that heaven is near if we will cultivate it in our lives. You are the Relief Society of The Church of Jesus Christ of Latter-day Saints. There is no other organization to equal it. Walk with pride. Hold your heads up. Work with diligence. Do whatever the Church asks you to do. Pray with faith. You may never know how much good you accomplish. Someone’s life will be blessed by your effort. May you know the comforting, rewarding embrace of the Holy Spirit, I pray in the sacred name of Jesus Christ, amen.